Our Center is a technical assistance (TA) group, located in the United States (Michigan), who are all accomplished trainers and coaches in the Motivational Interviewing model. The Director and all Center associates are members of the Motivational Interviewing Network of Trainers (MINT) community. 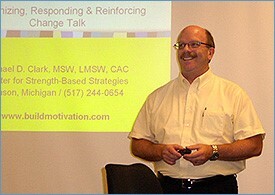 Michael Clark, MSW, is a member of the Motivational Interviewing Network of Trainers (MINT). Michael has trained groups throughout the United States, as well as Europe, Canada, the Caribbean, and Micronesia. With over 30 articles and a new book to his credit, Michael has important information to share about motivating challenging clients. The Center has associate trainers that have provided training to national audiences for juvenile justice, substance abuse, mental health, criminal justice/corrections, child welfare, education and specialty courts.